Akeno Misaki (岬 明乃) is the main protagonist of High School Fleet and the captain of Harekaze and Okikaze which was eventually renamed Harekaze. Her nickname is Mike (only used by Moeka China, her childhood friend). Her favorite phrase is "We'll figure it out!". A phrase that displays her easy going nature. Akeno has brown shoulder-length hair that she often keeps tied as two pigtails, one on each side of her head. The only time where she is seen letting her hair loose is when showering. She has blue eyes and light skin. She wears the standard Yokosuka Girls' Marine High School uniform. Occasionally, particularly in situations that involve taking command of the Harekaze, Akeno dons a captain's hat. Akeno is a forward-looking, big-hearted girl, brimming with luck. As captain of the Harekaze, she cares deeply for her crew members like "a father to the family." She cares for them so much that, when danger seems too great, she hesitates to put them in harm's way. She also refused to join Moeka to board the Musashi after hearing that her class might be dissolved as she deems it as abandoning her "family" despite her close relationship with Moeka. Despite her low self-esteem, she manages to make snap decisions effectively whilst under pressure for most occasions. Although her strategies have often placed the Harekaze under much stress, they have helped keep the crew safe while allowing them to perform their duties. Akeno can also remember names on the fly; she even gave every member of her crew their own nickname. Approximately nine years ago, at some point in her childhood, Akeno was involved in an unfortunate cruise ship sinking incident; though she was rescued by the Blue Mermaids, the incident claimed the lives of her parents. She still feels guilty for the loss of her parents due to not jumping off the ship earlier as her parents have instructed her to do so. Due to this tragedy, Akeno was inspired to join the Blue Mermaids. Following the tragedy, Moeka China, Akeno's childhood friend, shared with her the phrase "comrades at sea are like family", a belief that Akeno came to follow strongly, and the two friends made a promise to become Blue Mermaids together. Akeno barely passed the entrance exam at Yokosuka Girls' Marine High School, earning her command of the destroyer Harekaze. She set off with her fellow neophytes, including Moeka aboard the Musashi, only for the ship to be separated due to engine failure and navigation error. As soon as the ship came under fire from the infected Sarushima, much to the Harekaze crew's disbelief, Akeno made the decision to disable the Sarushima with a dummy torpedo. The ensuing damage to the Sarushima allowed the Harekaze to get away, only for the latter to be branded as mutineers in the process. Soon, the Harekaze found itself slugging it out with ships several times her size, including the Admiral Graf Spee, Musashi, and Hiei. However, with cool efficiency, Akeno and her uncanny leadership helped the Harekaze escape certain doom, earning the respect of most of her classmates. Upholding the saying: "Comrades at sea are all family," she even put herself in danger to save those at sea like Wilhelmina Friedeburg, deputy-captain of the Admiral Graf Spee who was attacked by her own crew when trying to escape. Such attitude, however, didn't sit well with a few at first, especially deputy-captain Mashiro, who believed that a captain must prioritize the safety of her own crew. Akeno's need to save her friend Moeka put the Harekaze in peril, which she regretted later. At times, however, such actions saved the lives of Ritsuko and Kayako when they were caught in an explosion while minesweeping. When the Musashi threatened to enter the Uraga Channel, Akeno suddenly lost heart and refused to give orders. She confessed to Mashiro that the only reason the Harekaze was able to win its battles is that things went their way, owing to sheer luck. Upon the encouragement of her classmates, however, she found the strength for one more fight. Much to her relief, the Harekaze managed to save the Musashi, allowing Akeno to reunite with her friend Moeka. Later, Akeno, along with her crew, salutes the Harekaze as it sinks to honor the ship. Her appearance while holding up Isoroku has been noted by many fans to be very similar to another character from a certain other game. With the exception of Mashiro, four of the bridge crew have a naming scheme, where their last names are taken from coastal areas in Japan such as Cape Irizaki. The captain herself is instead given the last name of Misaki with means "cape" or a small peninsula. Some fans have noted that Akeno bears some resemblance to Nanoha Takamachi from the Magical Girl Lyrical Nanoha series. Interestingly, Moeka, who is captain of the Musashi, wears an officer's uniform. However, Akeno, who is captain of the Harekaze, does not. While the reason is unknown, it is possible that the uniform is reserved for captains of capital ships such as cruisers and battleships. In Episode 1 ("In a Pinch on Our Maiden Voyage! "), Akeno mentions that skippers of ships like destroyers and supply ships are not considered officer-rank. Akeno, along with Moeka, performs the High School Fleet character song "Watashitachi Kinenbi" (Our Anniversary). Akeno's voice actress, Shiina Natsukawa, is one of the members of TrySail, which performed the opening theme "High Free Spirits." 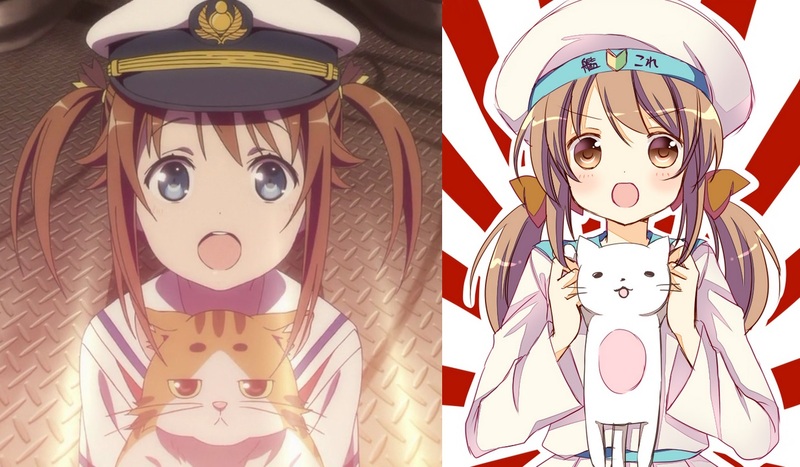 3 High School Fleet: Kantai Battle de Pinch!